To understand what increases image resolution in a microscope we need to know how the light source is transmitted through the microscope to your eyes. Once you have adjusted the diameter of the light﻿ beam, it passes through glass called a field lens (microscope point c) that transmits the beam upwards and through the condenser lens seen at Microscope point d. Stop now and check where they are on the microscope picture. The condenser lense, located just below your glass slide transforms the light beam into a cone of light, the point of which passes through the slide holding your specimen and is received as an identically angled v of light by the objective lens at the base of point h.
There are three types of condenser lens systems that differ in price and in the degree of correction for various kinds of visual aberration via the number and type of lense components that make up the system. An Abbe System has two or three lense components that are not corrected for visual aberrations. It will produce an image that is not sharp and is surrounded by blue green at the edges due to chromatic visual distortion. An Achromatic System correct for this via 3-4 lens components. aboration of a fisheye lens. The most corrected type of condenser lense system corrects for both these types of aberration via 8 lens components. This makes Aplanatic Achromatic systems very expensive. Luckily however, our eyes tend to ignore both these types of distortion so an Abbe system is adequate for fungi work. 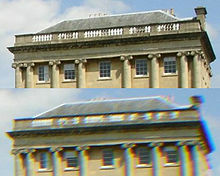 Distortions with an Abbe system will however be noticeable in photographed images. Furthermore, the microphotography camera lense is another source of visual aberrations so its quality should also be investigated. Software programs can provide some correction to image but will never makeup for a poor quality camera lens. Will have an NA of at least 1.25. The amount of light available and hence a microscope's resolution increases in proportion to the angle of the light cone transmitted by the condenser lens. This angle is known as the numerical aperture (NA) of lenses and is usually engraved on the side of the condenser lens. The best Abbe condenser systems have an NA of 1.4. Will have a Condenser focusing control that focuses the light cone formed by the condenser lens onto the slide (See Diagram point e). 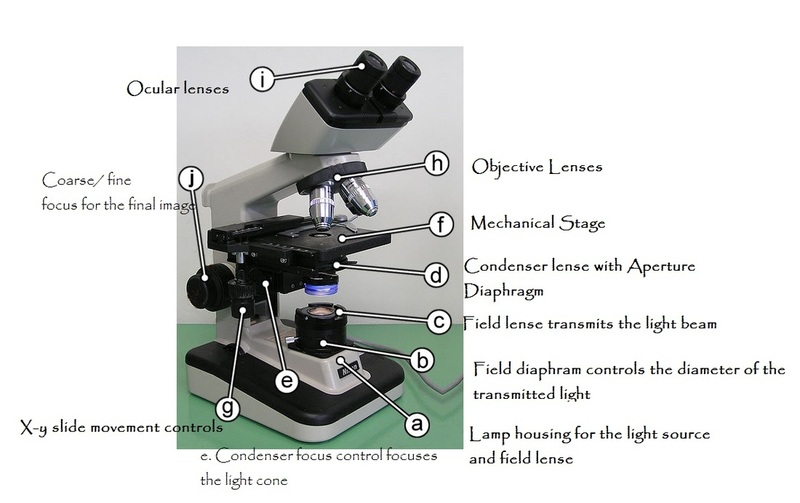 To optimise the light beam your microscope needs to have controls that will focus it (see point e), centre it and to control its aperture through the Condenser lense Aperture Diaghragm (point d). Will have a Moveable Aperture Diaphram that widens or narrows the angle of the light cone (see diagram point d). The aperture diagram needs to be adjusted every time an objective lens is changed. This is because each objective lens has a different NA, meaning that the angle of the light cone angle it can receive differs. Lower magnification requires less light and hence narrower light cone angles. Therefore, the cone transmitted by the Condenser lense needs to be narrowed to match lower magnification objective lenses and opened right out to match a 100 times objective lens. This is hard to achieve unless the condenser lens aperture diaphragm has a gradated numerical scale or some other system to enable adjustments. Will have centering screws or some other means of centering the condenser lens axis along the light path. Will have a Rack and Pinion system for adjusting the height of the condenser lens.